PP interlock outdoor sports flooring is a form of glue-less Floating flooring that is among the easier types of floor to lay, the PP interlock flooring is made of planks that lock together at the ends and sides via special fittings. They lock tightly enough to form a solid surface. They aren't glued or nailed to teh subfloor, but merely sit on top of it. Floor trim holds down the edges. Start with a firm, solid and clean subfloor of any flooring material other than carpeting. 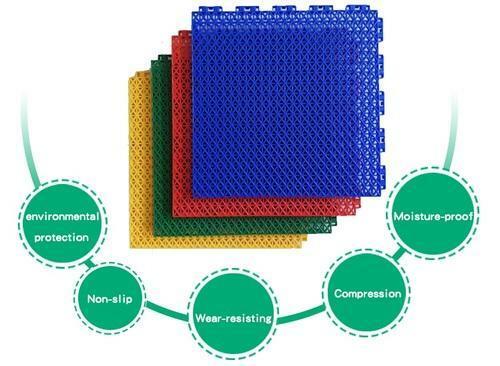 pp interlock flooring can be used as the surface of basketball court, tennis court, aerobics court,handball court, volleyball court, badminton court, roller skating rink,gym rubber, children playground, and other sports court. J P Enterprise provides the complete solution to efficient court construction. We are the manufacturer, wholesaler, trader, retailer, exporter, and importer are of Indoor, Outdoor Sports Surface, and Sports Equipments which are designed from a qualitative material, lattes technology and our business operations are led under the guidance of Architect and Civil Engineer. He designs a Perfect site plane. We are the suppliers of Indoor, Outdoor Sports Surface, and Sports Equipments which are designed from a qualitative material, lattes technology, and our business operations are led under the guidance of civil engineer. He designs a site plane. Our range of sports surfaces is widely used in various areas such as clubs, schools, hotels, stadiums, universities and more. With our vast experience, we are a distinguished supplier of sports surfaces, which are designed and installed by us using wooden and acrylic synthetic material with the help of best machines and manpower. Our range of products includes Basketball Pole, Table Tennis Table, Pool Table, Badminton Post and Tennis Post. We also provide Sports Flooring Services. We deliver our wide range of products across the country where great lover of sports exists. Due to lack of proper and perfect playing surfaces and training facilities, our country has been unable to produce world champions on regular basis. To cover up this problem, we offer perfectly designed sports surfaces which help playing games easily. Our products are designed using Wood based Indoor Surfaces and Synthetic based Outdoor Surfaces. These surfaces are made of new technologies and high standards for minimal maintenance.